Wow!! This is a tall shaker! Measures about 6 3/4" tall. 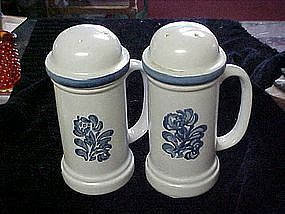 Made by Phaltzgraff in the popular Yorktowne pattern. Blue decoration on oatmeal colored stoneware. Original plastic stopper and in perfect condition. Two are pictured, but one met with an unfortunate accident so I am selling the perfect single one.